The North End Flyers were a team of players and management most of whom grew up and played sports in the North End of Winnipeg. In 1977, the Flyers entered a team in the Manitoba Assiniboine Intermediate Hockey League. 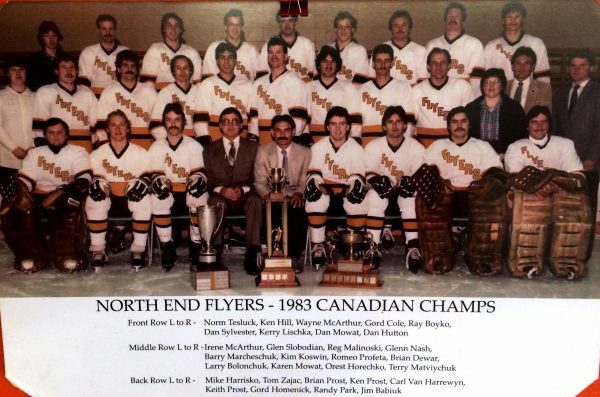 By the 1980- 81 season, the Flyers had reached the Canadian Intermediate championship, losing the Hardy Cup to the Charlottetown Islanders from PEI. Two years later, they would take the the Western Intermediate A title again setting up a Canadian final at home against the Timmins North Stars. The tough but skilled Flyers had very little trouble with the team from northern Ontario winning the best-of-seven series in four straight by the scores of 7-2, 4-2, 4-1 and 7-6. The victory brought the Hardy Cup to Winnipeg for the first and only time. Team Members: Norm Tesluck, Ken Hill, Wayne McArthur, Dan Sylvester, Kerry Lischka, Romeo Profeta, Brian Dewar, Tom Zajac, Carl Van Harrewyn, Gord Homenick, Randy Park, Dan Mowat, Dan Hutton, Glen Slobodian, Reg Malinoski, Glen Nash, Barry Marcheschuk, Kim Koswin, Larry Bolonchuk, Brian Prost, Keith Prost, Ken Prost, Jim Babiuk, Mike Harrisko, Coaches Ray Boyko and Gord Cole, GM Orest Horechko, President Terry Matviychuk, Trainers Karen Mowat and Irene McArthur.